Add some coziness to your kitchen space: For instance, a colorful and shaggy throw rug can make a world of difference in your kitchen. In fact, you could place a few brightly-hued throw rugs around the kitchen, such as in front of the sink or the refrigerator to make it more comfortable to stand in place, and to make the space seem cozier. Slap on a coat of fresh paint: You can brighten up your kitchen almost instantly with paint as one of the main components of your kitchen renovations. From painting your cabinets to using a complementary color for your walls, paint can do wonders for any kitchen remodeling in Gilbert , AZ project. 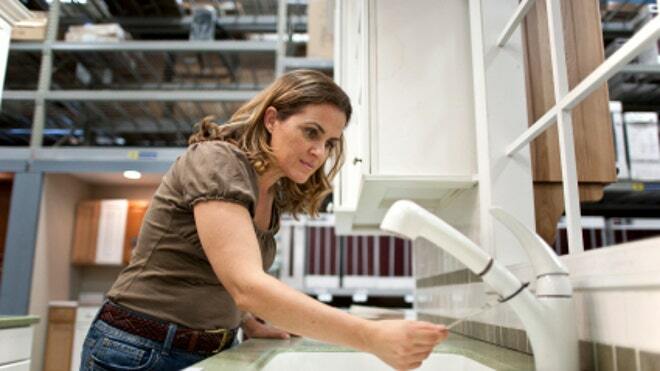 Go snazzy with kitchen faucets: You can really add new life to your kitchen with a new faucet. Not only can you opt for something more functional, but also you can utilize a faucet that adds aesthetic appeal to the space. Jazz up the kitchen with art: When you are engaged in kitchen renovations in Gilbert , AZ , you can use this as an opportunity to add artful elements to the space. Hanging art in the kitchen brightens it and makes it feel just that much more personalized. You might do a themed set of prints on the walls or add sculptures to shelves and other spaces around the room. Hang your kitchen utensils: This is how it’s done in professional kitchens and with good reason; it puts items within easy reach and also adds a creative touch to your kitchen remodeling in Gilbert , AZ efforts. Mix it up with cabinets and open shelving: This is a good way to hang on to some of the storage space in your kitchen while enjoying a more modern look overall. Cabinets provide a traditional flair and offer a space in which to hide food and other large and bulky kitchen items; open shelving provides a decorative option for your favorite dishes or art pieces. When it comes to remodeling the kitchen – which is easily one of the more highly trafficked areas of the home – many people believe that it takes big bucks to accomplish a new look for this space. Slap on a coat of fresh paint: You can brighten up your kitchen almost instantly with paint as one of the main components of your kitchen renovations. Jazz up the kitchen with art: When you are engaged in kitchen renovations in Gilbert, AZ, you can use this as an opportunity to add artful elements to the space. Hanging art in the kitchen brightens it and makes it feel just that much more personalized. There’s an old saying that the kitchen is the heart of the home. A desirable kitchen can raise the value of your home and make the time you spend in it more productive and enjoyable. Thinking about renovating this important room? Designers share the latest news in cabinets, appliances, and more. AFTER YEARS OF HUNKERING DOWN and spending less on renovations, many homeowners are ready to start giving in to the desire to cook up something new in their kitchens. While Isabella, 37, is known for cooking on TV and in the kitchen of his restaurant, when it comes to making meals at home, his approach is less hands-on. It is part of the overall treatment at CBAT, which simulates everyday activities so that patients can easily integrate back into homes and schools. From long and narrow “railroad car” apartments to teensy studios and rooms that seem to be all doors and windows, every home has its own design challenges. The solution: Don’t bother trying to squeeze a teensy table behind the door.